Stephen Ettinger, with LPL Financial out of Pennsylvania, is another financial advisor who has recently found what he is looking for through the Succession Link Platform. 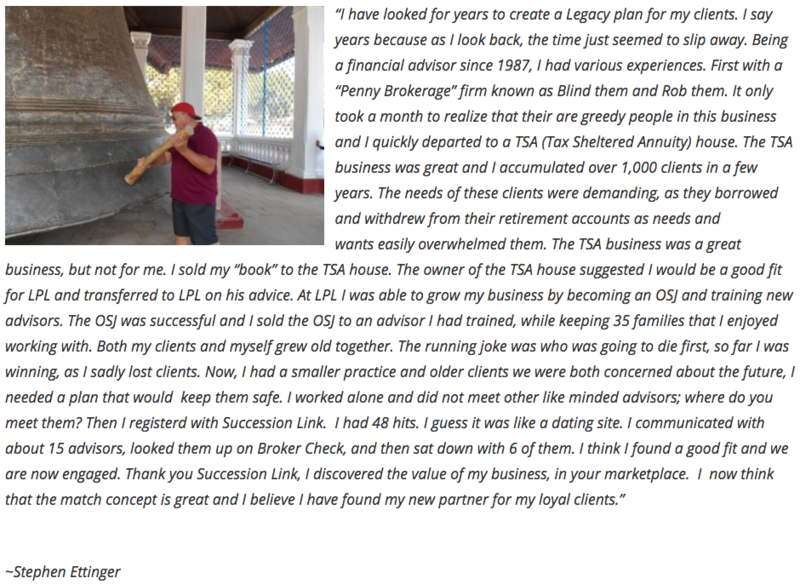 Hear his story and feedback using Succession Link. From all of us here at Succession Link, we would like to thank you for the opportunity to work with you. It was truly our pleasure to help you connect with the right advisor to create the Legacy plan for you, your clients, and your practice. We are dedicated to building trusted partnerships. We strive to serve the full lifecycle of and their businesses: start, growth, continuity, and succession by facilitating the online introduction of like-minded professionals and shaping the framework for productive and meaningful online social interactions.